Trade Gearbox your money for a giant box of gear. Borderlands has traditionally been about two simple pleasures: killing near everything that moves, and draining the contents of anything with a lid into what are, presumably, some awkwardly large pockets. 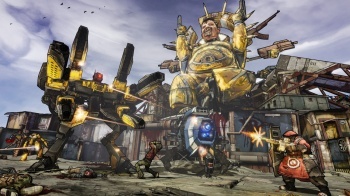 While you'll still need to wait for September to do the first, 2K Games and Gearbox Software are giving players the chance to case two limited edition collections of Borderlands 2 booty prior to launch. 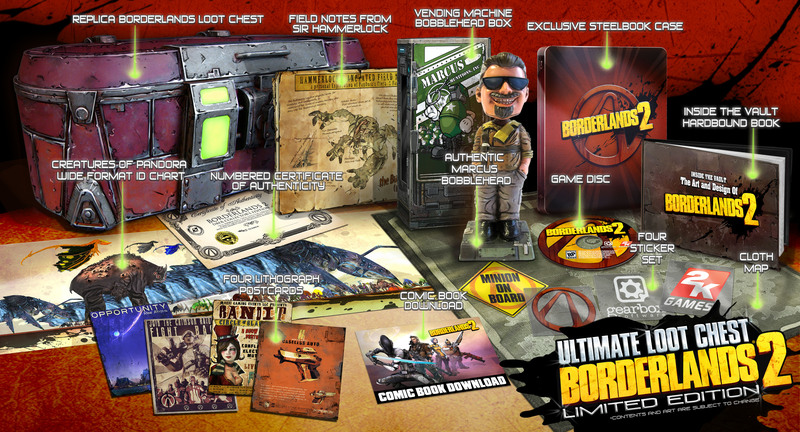 First up is the "Deluxe Vault Hunter's Collector's Edition" which comes stuffed with a Marcus Kincaid bobblehead, Inside the Vault: The Art & Design of Borderlands 2 hardbound book, sticker set, virtual comic, map, some yet-to-be-announced in-game downloadable bonus content, and, naturally, a copy of Borderlands 2. The whole package comes in at $100. Now, if something merely "deluxe" just isn't going to satisfy your epic lust for Pandora swag, 2K Games is also offering the "Ultimate Loot Chest Limited Edition" for $50 more. Pick up this set to receive everything from the Vault Hunter's edition, plus a scaled replica of the classic Borderlands red loot chest, a steel book case, a Creatures of Pandora wide-format ID chart, lithograph postcard set, field notes from Sir Hammerlock, cloth map of Pandora, and a numbered certificate of authenticity for when that stubborn buddy of yours just refuses to believe that those field notes weren't forged. All editions (including the run-of-the-mill standard) are available for preorder on Xbox, PS3, and PC. 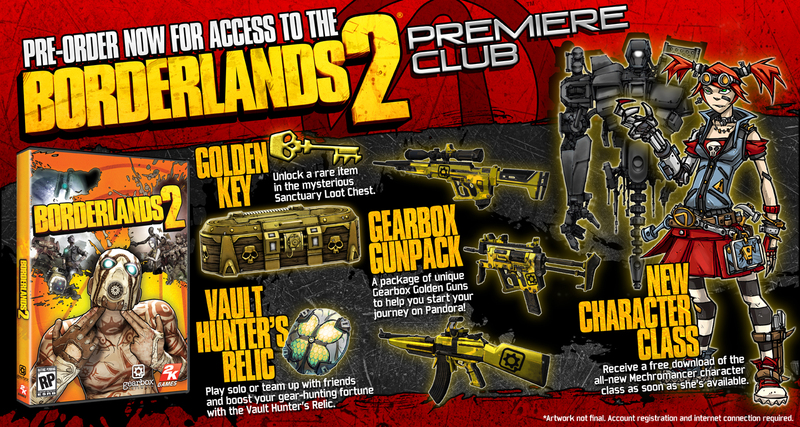 Gamers who plan ahead and lock in an early copy will also receive access to the "Borderlands 2 Premiere Club," which unlocks the Gearbox Gun Pack; a Golden Key that's "used to unlock a rare in-game item in the mysterious Golden Sanctuary Loot Chest;" the Vault Hunter's Relic, an in-game item that boosts the player's fortune; and the Mechromancer, an exclusive fifth character class that will only be available to non-preordering players via paid DLC sometime after launch. 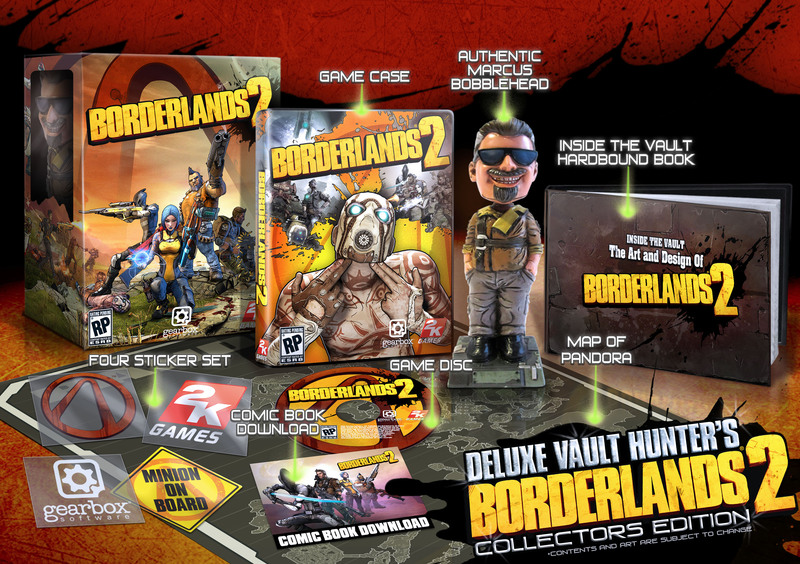 Borderlands 2 doesn't hit shelves until September 18th, but preorders are already up for grabs.